Using quality STI components (tube, basepad, spring, and follower), the STI Gen1 2011 magazine fits STI 2011, double-stack guns. They are available in 9 mm, 10mm, 38 Super, 40 S&W, and 45 ACP calibers in various lenghts. Note that the 140mm and 170mm magazines use the extended STI competition basepad, whereas the shorter length magazines use the STI carry basepad. 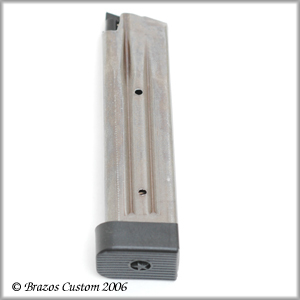 The 126 mm, "carry," magazine sits flush at the bottom of a standard siz 2011 grip. * It is legal for IDPA and fits the IPSC standard box. The 140 mm magazine extends below the bottom of the grip about 3/4 inch. It is the magazine of choice in both USPSA open and limited class divisions. 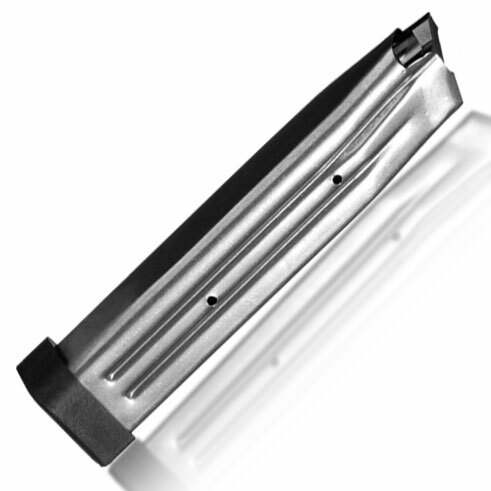 The 170 mm ("big stick") magazine, available only in 9mm and 38 Super, extends below the bottom of the grip about 1 1/2 inches. You'll want at least one big stick in your belt when you are shooting open class competition. *For states with magazine capacity limitations, the 126mm magazine is also available as a ten-round version. 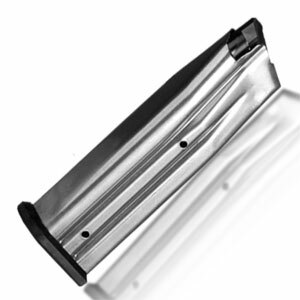 The 10-round magazine has deep ribs down the sides of the mag tube that effectively turn the magazine into a single stack and, thus, will hold only 10 rounds.